Mountain biking and Arizona are a match made in heaven. Arizona is home to large mountains, sprawling deserts, and picture perfect views. But it might still be surprising to experience some of Arizona’s most famous trails. These mountain biking trails go from the southern deserts to the northern forests and feature a remarkable diversity of terrain and difficulty. Here are 10 great mountain biking trails to try out on your next ride in Arizona. It may seem arrogant to name a trail the Arizona Trail. That is, until you realize the sheer magnitude of this epic trail. The Arizona Trail runs 800 miles across the entire state of Arizona. The trail starts at the U.S.-Mexico border and continues through the Sonoran Desert up through the Grand Canyon and the border of Utah at the Vermilion Cliffs National Monument. No local trail comes close to showcasing as much of Arizona’s diverse landscape and scenery as the Arizona Trail. It’s truly one-of-a-kind and is the best trail for bikers looking to experience Arizona to the fullest. Prepare for a different kind of hangover with the Hangover Trail. This three-mile trail in Sedona packs a serious punch in a short distance. The trail climbs up large red rock formations before a series of steep drops. The trail is only for serious riders that are able to handle quick technical maneuvers. However, the trail is worth the challenge for its gorgeous scenery alone. 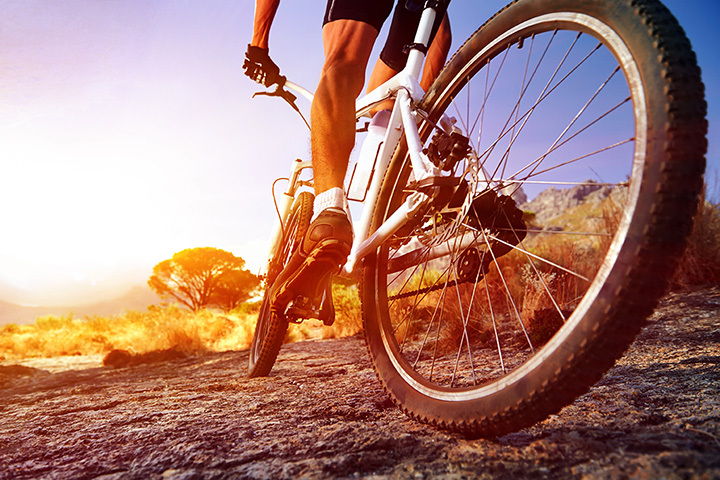 If you’re looking for a fun-filled day of biking, look no further than the Black Canyon Trail. This nearly 80-mile trail runs along the Sonoran Desert and into the woodlands of the Prescott National Forest. The trail is known for being one of Arizona’s best single track biking experiences. It includes tight switchbacks, diverse terrain, and epic views of Prescott Valley. Hiline Trail has it all—stunning views, steep drops, and technical climbs. This 10-mile lollipop trail is one of the most unique mountain biking experiences in Arizona. It’s a single-track trail that rides along a cliff edge on slick rock. The trail includes some of the most amazing views Sedona has to offer. Hiline Trail is a difficult trail with risky exposures. Only serious riders should attempt to ride Hiline without a guide. Less experienced riders in Sedona can get in on the fun with Slim Shady Trail. The 2.5-mile trail offers a nice alternative to more challenging trails while still offering unparalleled views of Sedona’s iconic red rocks. The trail includes a smooth ride along red dirt trails en route to larger trails like Hiline, Templeton, and Made in the Shade. Slim Shady includes several short but exhausting climbs for a full workout. Arizona isn’t just comprised of sprawling deserts filled with cactus. It’s also filled with vast forests and pine trees. There’s no better ride for a scenic tour of northern Arizona’s forests than Shultz Creek. This heavily trafficked 25-mile trail takes you on a tour of Flagstaff’s Coconino National Forest. The trail starts at 7,200 feet and includes uphill and downhill portions with stunning views of the mountains. This trail is best enjoyed during the summer to avoid snow and cold weather conditions. Don’t let the name fool you. The 50-Year Trail is actually relatively short at only 20-miles long. It’s one of the best trails that southern Arizona has to offer with areas for everyone from true beginners to experienced veterans. The single-track trail takes a scenic tour of Catalina State Park in Tucson. It features numerous rocky climbs and diverse terrain. It’s a pleasant trail that’s best enjoyed with repeat rides. Riding National Trail is no easy feat. This 14-mile trail cuts through South Mountain and challenges riders’ endurance, climbing abilities, and technical skills. The trail may be difficult, but its also one of the most fun rides in the state. It’s filled with short punchy climbs and beautiful desert trail. National Trail cuts through challenging areas of South Mountain and even leads to a waterfall. The Broken Arrow Trail is perhaps the most famous trail system in Sedona’s renowned mountain biking country. Broken Arrow actually encompasses several classic rides including Chapel Trail, Pit Tail, and Hog Heaven. The Broken Arrow portion is an easier ride along Sedona’s red rocks. The trails can go from easy to difficult in a moment’s notice. There are many narrow single-track cliff areas that offer stunning views and a thrilling adventure. Pemberton Loop is the crown jewel of Scottsdale for mountain bikers. The 15-mile trail takes a wide-open loop of the McDowell Mountains. The loop is best ridden clockwise and features a variety of hills, sharp turns, and change in terrain. The first nine miles feature slow ascents up the mountains whereas the final miles include high-speed rides and technical turns. The Pemberton Loop is a moderate trail and a favorite among local bikers in the greater Phoenix area.